Super Hero Boy: An all new Scooby Doo movie! An all new Scooby Doo movie! Scooby-Doo is one of those characters that never seems to get old. I remember spending hours and hours watching Scooby-Doo after school growing up and there is something about the show that has really stuck with me all this time. I even hate to admit this but I was secretly super jealous of Velma growing up as she had this cool geeky quality that actually came off as cute. The newest edition to the series is the all new Scooby-Doo Abracadabra-Doo Movie! Velma brings the gang to visit her sister, Madelyn, who is currently studing magic at the Whirlen Merlin Magic Academy. It seems to never fail though that where the gang goes trouble seems to follow (or they just happen to always be where the trouble is.. who knows?). Turns out the school has some problems keeping students as a mysterious Gryphon seems to be stalking the school. It ends up being up to Scooby and the gang to figure out exactly who and what is behind all these Gryphon sightings! As with all Scooby-Doo episodes things are never exactly how they appear to be nor is everyone exactly who they say they are! The movie itself holds true to the same sort of animation I grew up with as a kid only a bit cleaner and there are of course updates to the story line but never fear The Mystery Machine is still the same! Connor absolutely loved Scooby Doo: Abracadabra-Doo though I think he is a little confused as to why Melos can't talk like Scooby does... heh.. though would we really want to know what Melos would have to say if he could? 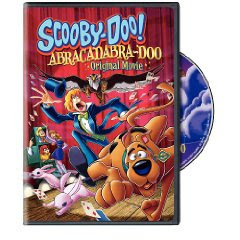 Scooby Doo: Abracadabra-Doo is available right now on DVD and you can pick up your copy on Amazon ! Warner Brothers was kind enough to give us three extra copies of Scooby Doo: Abracadabra-Doo to give away to three lucky winners! Leave a comment on this post. Just check out Scooby Doo: Abracadabra-Doo and tell which Scooby-Doo character is your favorite and why! This contest will end April 1st at midnight! I like Scooby Doo the best because he's loveable even though he's always in trouble. scooby is all our favorites, he is an eating machine and always makes us laugh. Scooby Doo is my favorite! He is so cool and very funny. Scooby is definitely our favorite because he is a big loveable, goofy dog. Thanks for the review and giveaway! I love Scooby Doo. He is adorable when he gets scared. Daphne is my favorite because she is pretty and smart too! My children love Scooby because he is so funny! Scooby Doo is our favorite because he's just so darn cute! always loved shaggy and scooby....they were a funny team! Velma is my favorite, because you know if she had a makeover, she'd be seriously hot. Scooby, of course. He's always hungry and I am too. I love scooby. He is hilarious when he gets scared. Scooby Doo. He never changes and is loveable. We all like Scooby, he's a big loveable dog and he makes us laugh! I'm already a e-mail subscriber! Thanks. Scooby has been my favorite since I was a little girl. I love how he always help solve the case even when he is scared. I like Shaggy the best because he makes my kids laugh! I always loved Shaggy!! Thanks for the chance. Shaggy is my favorite character because he is so funny. Scooby Doo is my son's fav - he is 7 and LOVES Scooby! removed your old button from my sidebar and replaced with the new "super cool" one! Scooby Doo is our favorite character because he is so cute! Velma is my fav because my best friend looks like her! I like Scooby the best. He is so lovable! Scooby because he's so adorable. My favorite character is Shaggy. I just love his "Far out" personality and that he can be best friends with a dog. Scooby-Doo is my favorite character of course. Shaggy is the best because he is so himself! I like Shaggy. Who wouldn't want this lovable goof for a best bud. My little nephews absolutely love Scooby Doo. This DVD would be a big hit in our house. Thank you for the chance to win. We have always loved Thelma! Well it depends who you talk to in our house. My son it is Scooby, I am a Shaggy fan and my husband think Velma is underrated. I love Shaggy b/c he's always thinking about his stomach (like me)! Thanks for the chance! Scooby Doo is mine and my 5 year old daughters favorite because hes adorable and really goofy..She loves Scooby doo hes one of her favorite cartoon charactors! My kids love plain ol' Scooby. Velma because I'm smart and ugly too. I have to say that Scoob is my favorite. When my 14 year old was 2his entire bedroom was done in Scooby Doo, we had the pillows and blankets, stuffed animals and all the VHS movies we could find!! Scooby just brings back such good memories. I like Scooby because he is a great friend! I like Shaggy because he's dorky. I picked Scrappy because he's so darling and innocent like in the things he does. I like all the characters but Scooby is my favorite. I like Velma because she is a smart girl. Fred; he is the anchor! I did check out the video clip but I have to say that my all-time fave character is Scooby-doo. My second fave character is Shaggy. I've loved them since the 70's when I was little. Scooby -he is so adventurous! How can you not love Scooby and Shaggy? They are hysterical! Scrappy doo is the best! Scooby Doo is my favorite because he is soo cute. Scooby because he is funny! I like Velma because she is smart. Scooby Doo because he's so funny. We'd love to win and enjoy this together! Let's hear it for smart girls, I like Velma the best.